And many varieties of tomato. That’s not all we will be planting this year, but that is what we have started so far. We also had to put our seedling stand elsewhere in the house. Year 1 we tried it in the basement. 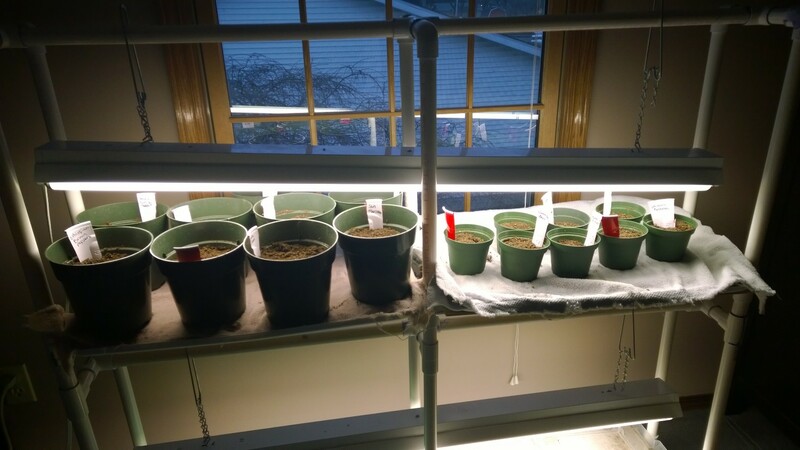 It was a wonderful learning experience and we learned that we won’t try to start seedlings in the basement again. Last year we put the seedlings in front of our slider which is on the west side of the house. They did awesome!!! This year it is in our bedroom by a south facing window. While I would rather have them by the slider again, they would be exposed to a dangerous condition in our home known as FS2 🙂 He is full of curiosity and I’m quite sure many of the seedlings would meet their untimely death as my little guy enjoyed playing in the dirt. So this year they will take up residence in our bedroom and I think they’ll do just fine there. It’s always exciting to begin the gardening season and the girls love helping. All the small pots are flowers and herbs Lili and Naomi planted. Next weekend we’ll get more started as I really want to stagger the planting this year so we don’t have everything producing at once. I tried my hand at some root vegetables this fall, but planted them too late in the year. I’m going to try putting a few out in early spring to see if I have any luck, so we’re only a few short weeks away from putting seeds in the ground outside. Hubby also bought a package of Ethiopian brown pepper seeds. This is a pepper variety we’ve never grown before and he is excited to try something new.